Stage 17 was an epic mountain battle that saw the Slovenian Primoz Roglic come out on top from the day’s breakaway. Meanwhile, in the general classification Fabio Aru (Astana) lost time to Urán, Froome and Bardet. It was a fast stage that was animated by Alberto Contador’s attack on the first HC climb and by fierce attacks on the Yellow Jersey on the slopes of the Galibier, however none were enough to unsettle the Team Sky rider. Let’s take a look at how Orica-Scott’s Roman Kreuziger (a Climber) Cannondale-Drapac’s Nathan Brown (an All-Rounder) and his teammate Dylan van Baarle (a Classics rider) all handled this tough mountain battle. To learn more about TrainingPeaks metrics, click here. The first 50km featured a downhill start before the field tackled the Category 2 climb Col d’Ornon. It was here that the day’s break containing stage winner Primoz Roglic went away. In this breakaway was also Dylan Van Baarle, who has been part of countless attacks during the Tour 2017. His effort on the attack: 414w, 5.31w/kg for 18:59min. To get into the 25-man strong break, he produced all his relevant peak powers of the day, most importantly 20min (414w). The break gained more than a minute on just that 5km climb, with 0.5w/kg more power. They pushed out their lead to a maximum of about five minutes approaching the Col de la Croix de Fer. Having to start at such an intense pace around threshold imposes a different physiological cost on the body after 16 Tour de France stages, and many of the riders out front would pay for it on the mythic Alpine passes to come. Van Baarle covered the first 53.7km in 1h17:30 with 41.5kph, producing 366w normalized power. This is massive power, before the race even hit the first major climb. Compare that to his teammate Nathan Brown in the peloton with 297w normalized for 1h22:25 and 40.0kph. Not easy either, but significantly less taxing for the American shielded by the field. The first mountain over 2,000m of elevation of this year’s Tour was the Col de la Croix de Fer (2,067m). The breakaway arrived with a five minute advantage, Thomas De Gendt (Lotto-Soudal) and Michael Matthews (Team Sunweb), having established a small lead on the rest of the escapees. The lead group hit the early, steepest slopes hard with van Baarle producing 419w, 5.37w/kg for 8:51min on the toughest 2.4km. The peloton increased the pace significantly once the climbing started as well. Team Sky really increased the intensity when Alberto Contador (Trek-Segafredo) attacked and started to make inroads on the breakaway, where three of his teammates waited for him. Roman Kreuziger was in the mix and close to the GC riders at this point and rode the steep part with 401w, 5.99w/kg for 8:16min. It was very hard climbing from here on out and many riders were dropped from the main field. The famous climb features three steps that are interspersed by two downhill sections that allow for some rest. All groups on the road had to produce strong efforts on the first step, 5.15km at 8.2 percent. Van Baarle (in the break) produced 396w for 5.08w/kg – the group climbed this sector in 17:49 minutes—while the GC group flew up this part. Kreuziger rode at 388w, 5.79w/kg and Brown at 379w, 5.83w/kg for nearly 16 minutes, respectively. The Yellow jersey group gained nearly two minutes here. The rest of the climb saw the field settle into a steadier climbing tempo between 5.1 and 5.3w/kg without ever easing off. Van Baarle gave it his best shot on the second step with 403w, 5.17w/kg for 25 minutes on the second step. He suffered due to the pace set by the climbers and dropped back on the final slopes of the climb. Aside from Contador’s attack, nothing critical happened on the Croix de Fer, but racing uphill for nearly an hour far in excess of 5w/kg took its toll on everyone, and would be felt later. In the 40km drag between the Croix de Fer and the Télégraphe, the gap between the breakaway and the peloton remained stable at around 3:15 minutes back. The riders used the long downhill followed by 15km in the valley to rest the legs and refuel. Kreuziger’s average speed on the 28km-long descent was 51.8kph at 117w ( 32:20 minutes). As the climb before, it featured two uphill interruptions of about 1km where he had to put out 300w or more. In the valley, Team Sky’s Kiryienka rode a strong pace for the Yellow Jersey that required 257w from Nathan Brown, as the group approached the biggest test of the day. 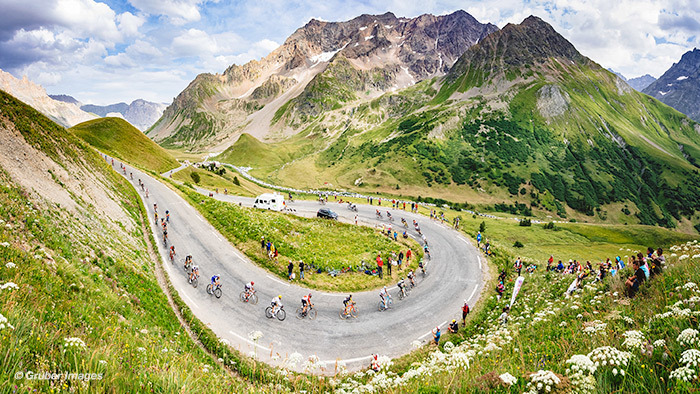 The duo of Alpine passes with Col du Télégraphe and Col du Galibier has been the stage for many epic battles in past Tours, and once again it would see the riders pushed to their limits. On the Télégraphe, the GC group was reduced to around 40 riders, and the break was able to increase their lead to nearly four minutes, with Bauke Mollema (Trek-Segafredo) riding a fierce tempo for Contador. The GC riders climbed the 11.7km ascent in 33 minutes and Brown and Kreuziger put out 353w and 364w average power – both at 5.43w/kg. The first 3.5km were particularly tough: 376w, 5.61w/kg from Kreuziger. The efforts on the Télégraphe proved too much for most of the guys that were still in the main group and as soon as they hit the first slopes of the mythical Col du Galibier, the group’s size was reduced to about a dozen riders. Both Brown and Kreuziger were dropped after producing desperate last efforts. The Czech climber from Orica-Scott tried to hang on for 4:20 minutes with 399w, 5.96w/kg – Brown made it for 1 km or 1:50 minutes with 373w, 5.74w/kg. Once they had to let the group ride away, it was game-over and the power dropped significantly below 5w/kg for the rest of the climb. Kreuziger lost 12 minutes until the finish, and Brown nearly 17 minutes as the strongest climbers fought for the overall classification and raced up the Galibier at 5.5w/kg or more. All that was left was a long, non-technical downhill. The main descent was covered by Kreuziger in less than 15 minutes at 60.0kph, maxing out at 76.7kph. He wasn’t taking huge risks, because his job for the day was done. The high mountains of the Alps revealed mercilessly which riders had recovered well from previous efforts and were still in the mix for stage wins and the general classification. It was a real race of attrition, and each subsequent climb ruled out more riders until only a chosen few remained. To be able to compete, it is necessary to produce 5.5w/kg for 30 to 60 minutes on all the climbs and also to follow attacks at over 6.5w/kg. Brown and Kreuziger could do that for two of the three major climbs—but the third proved too much. Still, their performances were very solid, as indicated by the huge training loads of 328 to 340 TSS. These numbers are especially impressive considering they rode in service of the team captains, Simon Yates (Orica-Scott) and Rigoberto Urán (Cannondale-Drapac). Get more Tour Stage analysis, course predictions and training takeaways from this year’s Tour de France here.